How co-working and SMART technology has changed the office. With relentless demand for tech-enabled, flexible commercial space sweeping across London, landlords and developers have struggled to keep pace. Traditional office design has long since been left behind, and the focus now falls firmly on delivering the kind of responsive work places needed to suit the modern workforce. Real estate investment in the UK reached £17.9 billion for the second quarter of 2018, an increase of 15% for the last 12 months. This has led to a flourish of growth across the whole market, shaped by changing demands from all business sectors. From mature corporates to small start-ups, the way office space is used has radically evolved. Increasingly, tenants are demanding dynamic space let under flexible leasing solutions, with the harnessing of Self-Monitoring Analysis and Reporting Technology (SMART) now crucial to the success of delivering modern office environments. 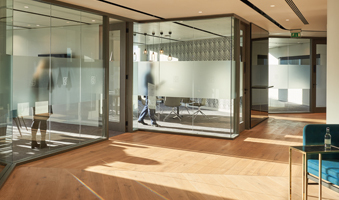 The challenge facing designers, as we move into the new age of the office, is two-fold as they must provide the diverse facilities demanded to improve staff well-being and aid retention, whilst also future-proofing buildings to make them resilient to future change. Their designs must now provide elements of both the modern and traditional, seamlessly integrating the two into one supple space. 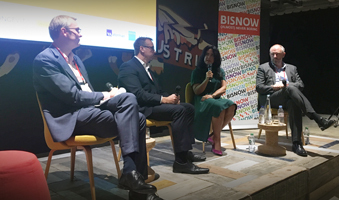 Casting an eye over this challenge, as well as investigating the current trends in London’s office spaces, was the remit of a panel debate at Bisnow’s recent ‘London Building for The Future’ event. We spoke to panel members Mark Terndrup (Director of Waterman Building Services), David Hutton (Director of CORE), Francesca Gernone (Partner and Head of Interior Design at Fletcher Priest Architects) and Tim Barnes (Business Development Manager at Synapsys) on their views of the office market and how they are responding to the requirements of the modern office user. Whilst using co-working space provides a solution for businesses looking for flexible premises in these uncertain economic times, many are also finding it difficult to predict headcount over the next three to five years. As a result, they are looking for shorter leases on office spaces that can be easily moulded to their exact specifications. With building users now demanding more flexibility in the kind of work place they chose and its design, they also expect increased levels of control over how it operates. As a result, SMART is playing a central role in improving user experience of the office. Evidenced by the recent rapid change in the market, the co-working revolution looks set to permanently re-shape commercial office space across London. Driven by the need for SMART enabled, flexible and ‘healthy’ buildings, landlords and developers are now shifting the design of their facilities away from the traditional ‘serviced office’ model, and are focussed on providing tenants with the dynamic, responsive buildings the modern workforce demands.